A 20-foot sand castle recently rose up in a small plaza across from Water and Moore Streets, steps from the Staten Island Ferry Terminal in Lower Manhattan. A steady stream of commuters disembarking the ferry have watched sculptor Matt Long spend his days carving the pint-sized palace out of a sand mound dumped amidst the steel and glass office towers that dominate the area. What are you gonna do if it rains? Asks a guy on his way to the ferry. Part of a campaign to occupy the privately owned public spaces in the Seaport Area through the middle of August, possibly to keep protesters out of them, the Water Street structure is one of hundreds of sand sculptures Long has made his living carving over the last decade. When he isn’t busy sculpting towers and turrets, Long talks with the many onlookers who gather to watch him work. One of the most common questions they ask him is how he protects his sand sculptures from the wind and rain. It seems like scant protection against the elements but Long has built his quixotic career on the formula’s effectiveness. So how has he managed to make a living building sand castles for the last ten years? “Ho, gimme the money!” is Long’s short answer. Currently, in addition to selling his Can You Dig It? line of sand tools, he takes part in an annual round of competitions around the world and across the U.S. in beach towns like Hampton Beach, NH, Revere Beach, MA, Virginia Beach, VA and Siesta Key, FLA.
Long will be spending much of August at the Jersey Shore, working on a series of kid-friendly sculptures for the Stronger Than The Storm campaign and carving a commemorative sculpture at nearby Monmouth Park Race Track during their annual tournament. Long says he also does team building events for large corporations, citing American Express as a recent client. Despite it’s romantic appeal, Long isn’t sentimental about his castle-building work. The Water Street sculpture that was supposed to stand until July 31st was still standing on August 18 and Long says he fully expects to be driving a little back hoe and loading the Water Street castle into a dumpster before the summer is through. That was how a passerby summed it up for me when our respective paths came to a halt before a downed tree in Riverside Park. It was one of dozens of majestic tress struck down by the massive storm. Famished animals, many left homeless by the hurricane, forraged for food among the litter of leaves and branches. In the course of a walk by the river I saw feeding squirrels and starlings, some ducks and even a red-tailed hawk. 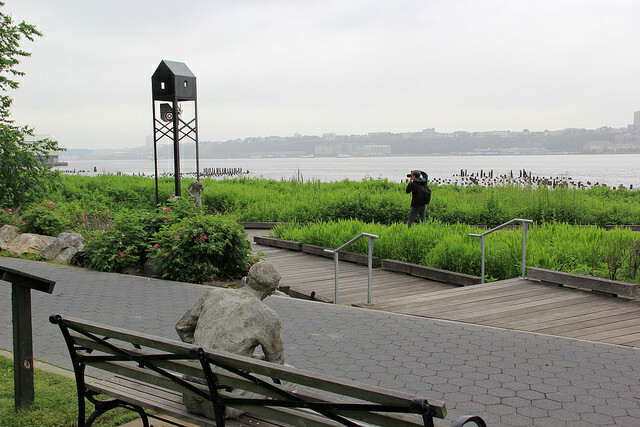 A group of birders gathered at the 79th Street Boat Basin Cafe to watch storm-tossed ocean birds make their way up the Hudson toward New York Harbor, and ultimately back to the sea. “Storm Petrels and jaegers are things that we wouldn’t ordinarily see here but after hurricanes they often turn up,” said Dr. Richard Fried a veterinarian and local birder. According to Fried, The Ornithology Department for the Museum of Natural History has put out a call asking birders to bring the bodies of rare species they might come across to the museum to be added to their collections. POSTSCRIPT: 1/5/13 Columbia University Journalism School students Matthew Claiborne and Salima Koroma produced this great piece on post-Sandy birding using some of the above footage shot along the Hudson River during and after Sandy. Variously known as “Frankenstorm” and “Megastorm,” Hurricane Sandy made her way toward NYC this afternoon. With mass transit service suspended and school closings across the city, many New Yorkers were treating the approaching Category -1 storm like a snow day. Everyone seemed much less uptight than they did around this time last year when Hurricane Irene loomed just off shore. The fact that Sandy is a storm roughly twice the size of Irene doesn’t really sink in until you see it on paper. 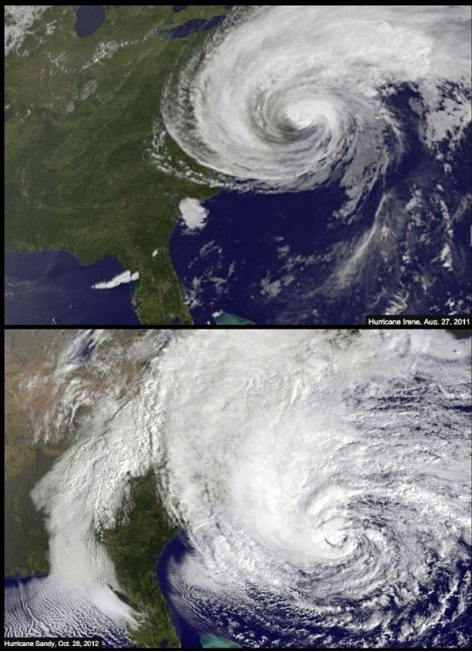 Irene (above) vs Sandy (below). Endurance artist David Blaine has been standing atop a 20-foot pedestal on Pier 54 in Lower Manhattan since Friday night (10/5/2012). Surrounded by four active Tesla coils casting a million volts of electricity his way, he looks like Frankenstein’s grandson. Monday night brings Blaine’s finale and, hopefully, his triumphant exit from the giant bug zapper he’s confined to for 72 hours. The event, which recalls the death-defying feats Harry Houdini amazed New Yorkers with nearly a century ago, is being sponsored by Intel to showcase a new laptop computer, but Blaine and the New Yorkers bearing witness to his superhuman stunt, are the real stars of the show. POSTSCRIPT: 10/9/12 He did it! Congratulations to David Blaine for withstanding 1 million volts and three days of exposure — both elemental and media-driven — on Pier 54. It was magical. I tagged along with members of Occupy Wall Street’s marine contingent Saturday as they sailed out of the 79th Street Boat Basin bound for Staten Island. Read the full story here. Several crew members remained on board after the tour, flying protest banners and drumming well into Sunday. They anchored 20-30 yards southwest of the derelict 69th Street Transfer Bridge, an area beyond the boat basin mooring field the protesters had been prohibited from demonstrating in by the Parks Department. Around 3:00 Sunday afternoon, crew member John Eustor shot this footage of a dolphin swimming around the boat. A fellow disenfranchised American? Crew-members speculated that it may have been drawn to the boat by the vibrations from their drum playing. A number of people photographed the animal as it made it’s way toward New York Harbor. Sadly, a dead dolphin was found floating in the marina at Chelsea Piers several days later. Many assume it was the one spotted on Sunday afternoon. Results of a necropsy by the Riverhead Foundation are forthcoming. Read more here.